Rechargeable batteries have a lower capacity than disposable alkaline batteries. It's best to recharge batteries slowly. Ad - Battery reconditioning instructions for the do-it-yourself battery tech - save money, and learn how to recondition your own rechargeable batteries. This is really a huge challenge for all of us because you can see companies everywhere advertising their "battery fact" as rated capacity and what they are really doing is perpetuating the "battery myth" that disposable batteries have a greater actual or available capacity than rechargeable batteries. For most high drain electronic devices, like digital cameras, rechargeable batteries will continue to work much longer than alkaline batteries. In fact, in devices like digital cameras, NiMH batteries will run on a single charge for 3-4 times as long as they would on an alkaline battery. 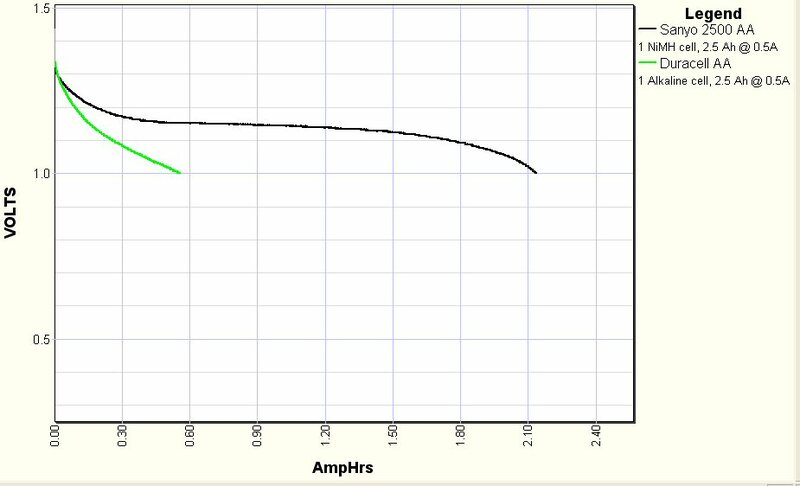 Look at this chart of a brand name alkaline battery and a high capacity NiMH battery both set up in a computerized battery analyzer and subjected to a high drain rate of 500 mA. You can see that the NiMH battery lasts WAY longer than the poor old alkaline battery when subjected to this high discharge rate. "Heavy Duty" batteries are often the least powerful batteries you can buy and some "quick chargers" can take as long as seven hours to recharge a set of batteries! I believe these terms didn't start out as misleading. For example the term Heavy Duty battery was used to refer to Zinc chloride batteries which had about 50% more capacity than traditional carbon zinc batteries. But that was 50 years ago! Calling zinc chloride batteries heavy duty became misleading once alkaline batteries with 300% more capacity than zinc chloride batteries became available. A similar situation happened with battery chargers. Originally NiCd battery chargers took anywhere from 12-24 hours to recharge NiCd cells. Later, chargers that could recharge NiCd cells in half that time were introduced. Unfortunately, calling these chargers "quick chargers" was a real disservice to the rechargeable battery industry. Anyone that purchased NiCd cells and a "Quick charger" only to realize later that a quick charge took seven hours must have been very disappointed. I know I was. The good news is that it's now possible to buy a battery charger that can recharge batteries in less than two hours, and in some cases even as fast as one hour or less!! Unfortunately, even comparing the capacity ratings of similar types of batteries won't always work because different manufacturers often measure battery capacity in slightly different ways. (Not true. See next item). Assigning capacities to batteries can be very tricky, that's probably why you don't see capacity ratings marked on most alkaline batteries. When powering high drain electronic devices like digital cameras, computer peripherals, or portable music players, an alkaline battery will only deliver a small fraction of its rated capacity. A NiMH or NiCd battery is likely to deliver much closer to its rated capacity when it's powering high drain devices. This means that a NiMH battery with a rated capacity of 1800 mAh can take many more photos than an alkaline battery with a rated capacity of 2,800 mAh.